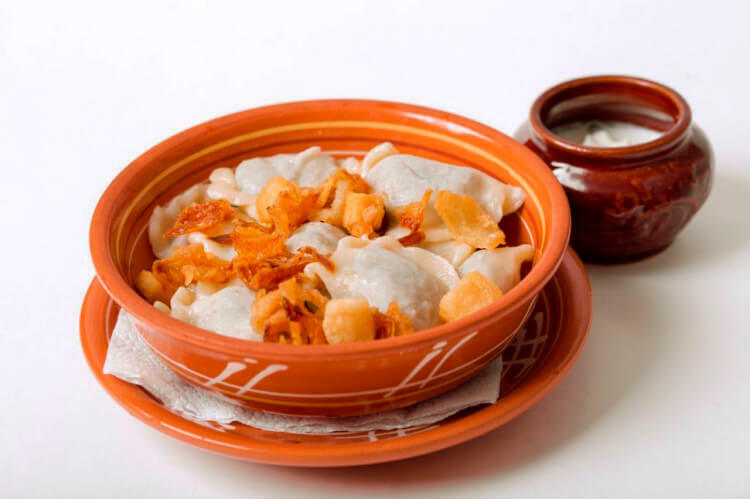 One of the most popular and beloved by many generations of Ukrainian national dishes is dumplings (varenyky). 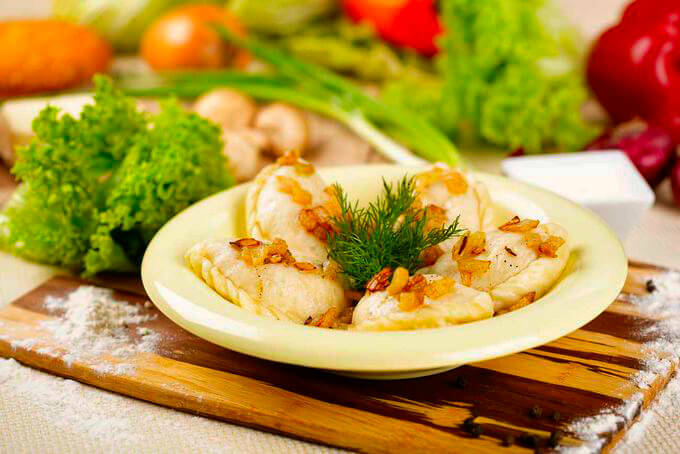 The filling for pierogi is the main component of a dish. 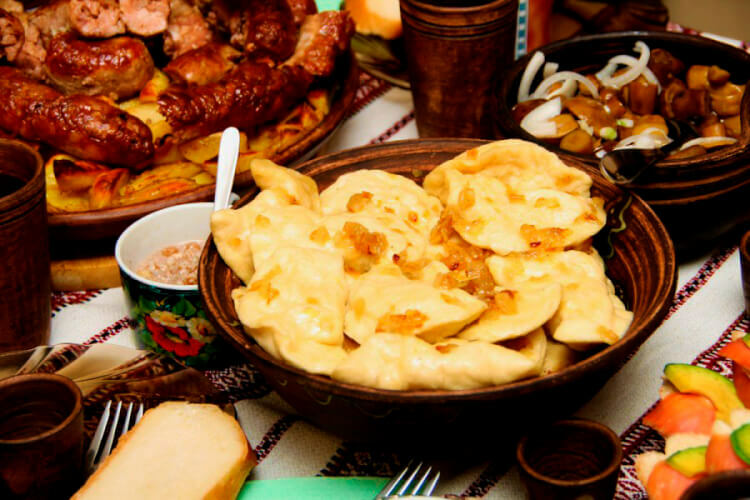 The overall taste of varenyky depends on filling components, their caloric content, taste, and method of cooking. 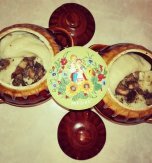 They are dozens of recipes for varenyky fillings - from savory and salty to sweet and sugary. 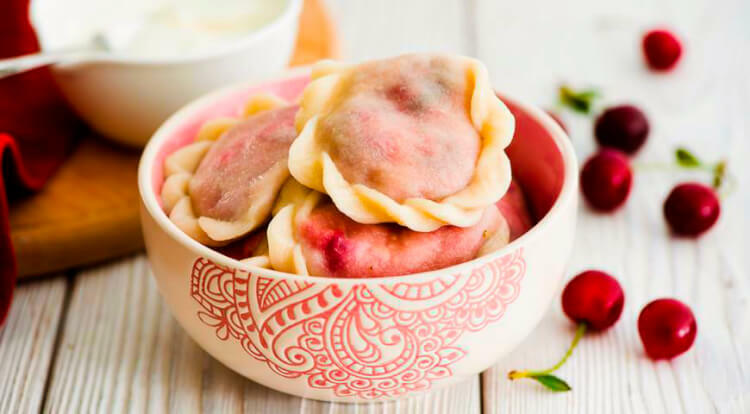 Dumplings with meat, potato, mushroom and/or cabbage serve as an excellent option for a nourishing second meal, while dumplings with berries and fruits are successfully served as desserts in the Ukrainian cuisine. The cottage cheese filling is the most universal one as it can be cooked in both salty and sweet versions. 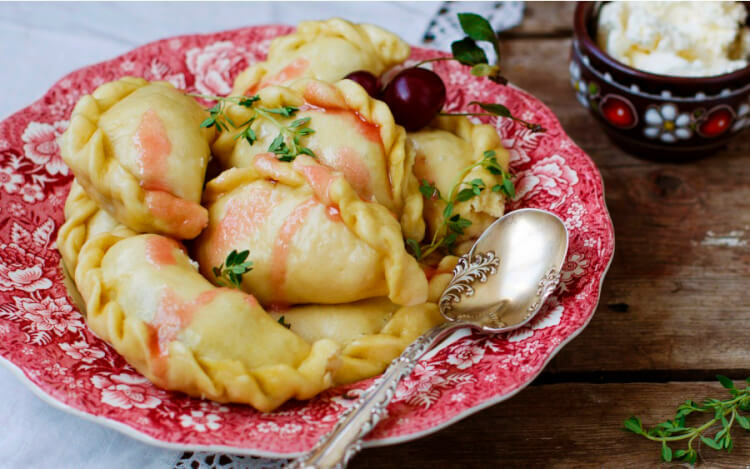 Today we are glad to share with you 24 yummy and rich fillings for Ukrainian pierogi (varenyky). Peel, finely cut, and golden brown 2 bulb onions on dairy butter. Add 200 g (7 oz) of peeled and sliced champignons. Fry until liquid dissolves, stirring the mass continuously. Peel, boil, and mash 500 g (17,5 oz) of potato. Combine potato with mushrooms. Adjust salt and black pepper to your taste. Stir the mass carefully. Rub 200 g (7 oz) of pumpkin on a coarse grater and stew it until cooked on dairy butter. Add 200 g (7 oz) of sour milk cheese, 80-85 g (3 oz) of sugar, and vanilla. Mix everything until smooth. Rub 7-8 fermented cucumbers on a coarse grater and put them in a colander for 30 minutes to let the brine drain. Add 1 tablespoon of sour cream and pepper. Stir the ingredients thoroughly. Rinse and cut chicken or beef liver into medium pieces. Coat each piece with a bit of flour and fry in vegetable oil lightly. Add a chopped bulb onion and stew everything under the lid. Let the mass cool and pass it through a meat grinder. Peel, boil, and mash 5 potatoes. Add the liver mass. Mix everything well and season with salt and pepper. Preheat vegetable oil and fry one finely chopped bulb onion and one coarsely grated carrot. Add finely shredded fresh cabbage (if the head of cabbage is too large, then half will be enough) to the pan and cover with a lid. Stew everything on low heat until done, stirring from time to time, At the end salt and pepper the filling. You also can add a bay leaf, fresh, or dried herbs. Boil 500 g (17,5 oz) of potato in salted water. Add 50-55 g (1 oz) of dairy butter and mash potatoes. Add 300 g (10,5 oz) of grainy sour milk cheese, salt, pepper, and finely chopped dill. Mix everything thoroughly. Peel and core 6 apples (preferably sweet). Grate them coarsely and add 80-85 g (3 oz) of sugar, 1/2 teaspoon of cinnamon, and 1/2 tablespoon of starch. Stir everything carefully and start to fill dumplings at once before apples start releasing their juice. Boil 300 g of meat (beef or low-fat pork) in salted water. Let the meat cool and pass it through a meat grinder. Preheat vegetable oil and fry two finely cut bulb onions for 10-15 minutes. Combine meat with onion. Adjust salt and pepper to your taste. Mix everything thoroughly. Boil 200 g (7 oz) of beans until done and pass them through a meat grinder or grind beans in a blender. Brown two chopped bulb onions in vegetable oil, add 400 g (14 oz) of sliced champignons and fry until the liquid evaporates. Mix all the ingredients together. Salt and pepper the mass. Cube 300 g (10,5 oz) of champignons and fry them in vegetable oil. Cool the mass and combine it with 200 g (7 oz) of grated hard cheese and 1 crushed garlic clove. Add salt and pepper to taste. You can also add 1 teaspoon of chopped parsley if you want. Shred half head of cabbage finely. Preheat vegetable oil and stew the cabbage together with 1 chopped bulb onion. Combine the mass with 200 g (7 oz) of minced meat (beef or turkey) and cook under the lid for 15 minutes. Add salt and pepper and turn off fire. Fry 150 g (5 oz) of salo until you get brown and crispy cracklings. Fry 1 chopped bulb onion until translucent. Boil 600 g (21 oz) of liver in salted water until done. Combine liver and cracklings and pass them through a meat grinder. Salt and pepper the mass to taste. Put 500 g (17,5 oz) of sour cabbage in the colander to drain. Chop 2 small bulb onions and fry them until golden brown. Combine onion, cabbage, salt, pepper, add 1 teaspoon of sugar. Mix and stew everything for 30-40 minutes. Combine 500 g (17,5 oz) of cottage cheese/curd cheese, 1 egg, 2 tablespoons of chopped dill and 1 tablespoon of dried cumin seeds in a bowl. Stir the mass thoroughly. Adjust salt and pepper to your taste. Drain 500 g (17,5 oz) of sour cherries and remove pits (if you have frozen cherries – unfreeze them and drain juice). Mix berries with 150 g (5 oz) of sugar and 1 tablespoon of starch. 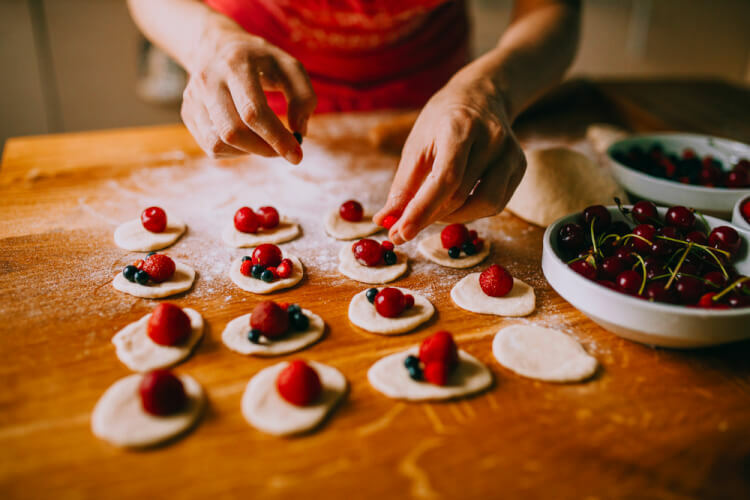 You can cook a dumpling filling with any other berries in the same way. Take 500 g (17,5 oz) of cottage cheese/curd cheese and pass it through a meat grinder or grind in a blender. Add 2-3 tablespoons of sugar, 1 egg, and a pinch of vanilla sugar. Stir everything well. You can also add a handful of raisins if you wish. Wash 200 g (7 oz) of dried mushrooms and pour cold water above. Leave mushrooms for 2-3 hours. Boil them on low heat 20-30 minutes. Turn off fire, drain off water, and cool mushrooms. Chop two bulb onions finely, fry them until golden brown in dairy butter. Add mushrooms to the onion and cook them for 10-15 minutes. Salt and pepper the mass to taste. Grind the mass in a blender or pass it through a meat grinder. Put 180 g (6 oz) of poppy seeds in a bowl and pour boiling water above. Rinse poppy seeds thoroughly and drain water. Pour boiling water above again and leave poppy seeds for 15 minutes. Drain water, pass poppy seeds through a meat grinder or grind them in a blender two times. Combine ground poppy seeds with 90 g (3 oz) of sugar and mix well. 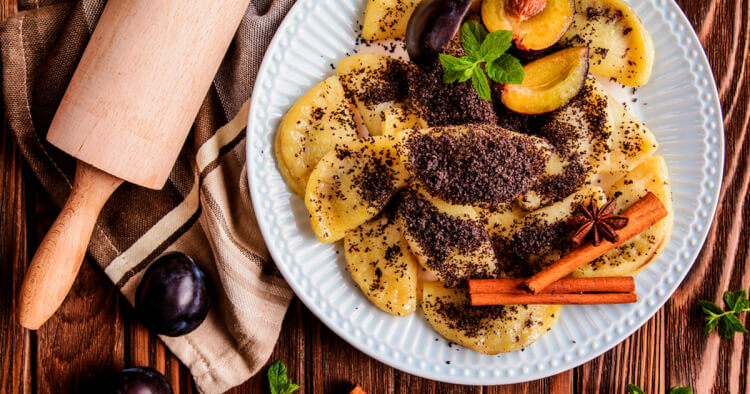 Unlike other types of dumplings, varenyky with poppy seeds can’t be stored for a long time, they should be cooked at once, otherwise, the dough will lose consistency. Rinse and cut 400 g (14 oz) of beef or chicken liver. Coat liver pieces with flour. Preheat vegetable oil in a frying pan and cook the liver until done together with 1 chopped bulb onion. Cool the liver and pass it through a meat grinder. Add salt, pepper, fresh herbs, and mix everything well. Wash 800 g (28 oz) of liver and remove the outside membrane. Chop the liver and fry it in vegetable oil. Rinse 180 g (6 oz) of buckwheat and cook fluffy buckwheat. Cut 1 bulb onion finely and fry it until golden. Combine liver with onion and pass them through a meat grinder. Then add buckwheat, salt, and pepper. Mix the ingredients well. Fry 500 g (17,5 oz) of finely chopped fresh cabbage and then add 5 finely diced champignons and one chopped bulb onion. Stew the ingredients to evaporate the liquid and then turn off fire. Take a herring and cut off the fish's head. Remove insides and skin from both sides. Detach herring fillet from the bones and cut it finely. Combine cabbage and herring and season them with salt and pepper. Wash 300 g (10,5 oz) of sour cherries and remove pits. Place cherries in a pan and top them with sugar. Heat the berries stirring them continuously and add semolina. Boil the mass on low heat, often stirring, about 20 minutes. Cool the sour cherry-semolina filling completely before you start to stuff dumplings. Pour 150 g (5 oz) of dried mushrooms with water and leave them for 1 hour. Then boil mushrooms until done. Cool and chop them. Chop 1 bulb onion and fry it on dairy butter until golden. Add mushrooms, salt, and pepper. Mix everything well. Rinse rice and boil it in salted water until done. Combine rice with mushrooms and onion. Season the mass with salt and pepper. Wash 300 g (10,5 oz) of sour cherries and remove pits – if fresh, unfreeze berries if frozen, and drain juice if canned. Mix cherries with 50-55 g (2 oz) of sugar and 1 tablespoon of starch. Break 100 g (3,5 oz) of chocolate into pieces - about 1 x 1 cm. 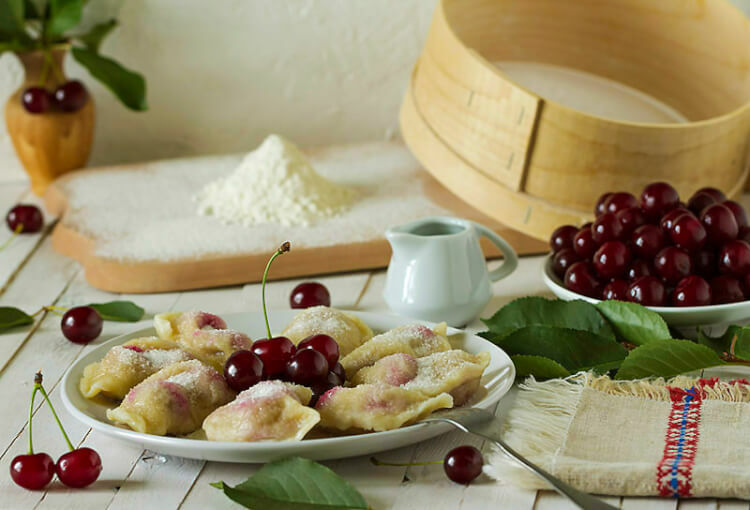 Put 2-3 cherries and a piece of chocolate into each dumpling. Tightly seal the edges. 1. 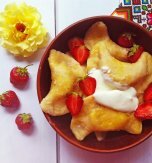 It is recommended to put starch in the berry filling to thicken the juice and to put an egg in the cheese filling for a smoother texture. 2. If you cook potato dumplings you can add garlic, bulb onions, fresh herbs and/or spices for more piquancy. 3. It is important to stuff pierogi with a warm filling, not hot. 4. 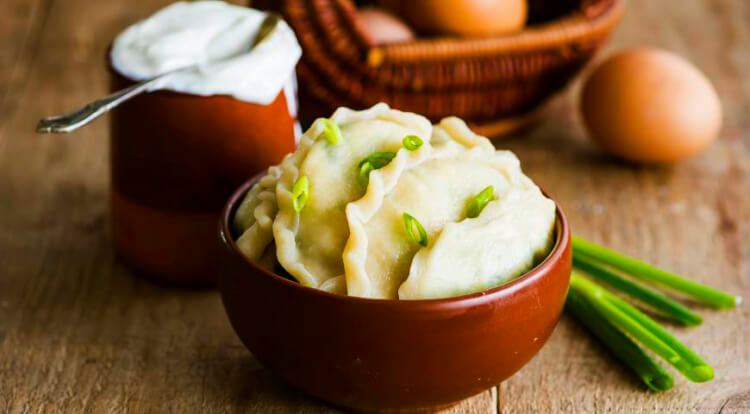 Dumplings with different fillings are put only in boiling and salted water. 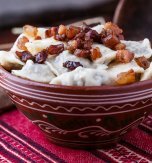 Have you liked the article about fillings for Ukrainian dumplings?